Same artist, same smile – 2008 – 2017. 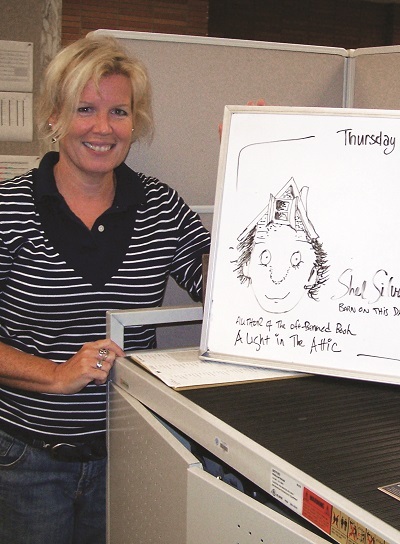 Joanne Quinn, graphic designer and now director of the Communication and Marketing Dept., has been Falvey’s whiteboard artist for many years as shown in this 2008 photograph. It all began when Luisa Cywinski, now the director of Access Services, asked Quinn to create something for Balloon Day, April 15, 2008. From then on, she has been using dry-erase markers to create whiteboard illustrations with topics appropriate to the particular day. Quinn compared her work to sand art in that it is temporary.